A few years ago, Jose and his now 4-year-old son moved from Honduras to Charlotte, NC to find a better life. Jose had lost both of his legs beneath the knee in an automobile accident and was confined to a wheelchair – which made providing for his son, who has cerebral palsy, a difficult and overwhelming task. Enter Care Ring, one of the state’s oldest health-related nonprofit organizations, based in Charlotte. Their mission for the past 60 years has been to help people with limited resources get the health care that they need and to help them on a path of maintaining good health. Care Ring assists nearly 7,000 Charlotte residents each year through three cornerstone programs. One of those programs is Physicians Reach Out (PRO) – a physician referral program where 1,600 local physicians and other providers offer free, comprehensive medical care to more than 4,000 low-income, uninsured patients each year. This program alone resulted in $17 million in donated care last year, not to mention the savings from avoided Emergency Room visits, estimated in the millions. It also helped get Jose a new pair of legs. Kelly Musante with Care Ring was with Jose when he was fitted for his new prosthetic legs and feet. She says about the experience, “I don’t really have the words for it. He rolled in on a chair and walked out on his own. And now he can run and play with his son. He can work. He can help bring in income for his family. It was life-changing. And made possible by one of our PRO partners. Charlotte is one of the top financial hubs in the country, and the richest city in North Carolina. But it also has some of the most intense pockets of poverty in the state. The juxtaposition of wealth and poverty is something that you’ll find in most of America’s larger cities, and Charlotte is no exception. More than 64,000 low-income Mecklenburg County residents remain uninsured and rely on safety-net organizations for their healthcare needs. Fortunately for Charlotte, there is a program like Physicians Reach Out that helps the uninsured get the health care they need. Health care providers from all types of practices, including primary care, and specialties such as orthopedics (like in Jose’s case) and oncology. In other words – everything from an annual physical or check-up for the sniffles, to long-term care like chemotherapy and physical therapy. One critical component of the program is case management to provide support for patients with complex medical needs and socio‐economic challenges. PRO’s current case management staff (only one nurse case manager and one bilingual social worker), has the capacity to serve approximately 150 patients a month – whereas the recommended maximum caseload is only 100 patients. Approximately 35 percent of adult patients in the PRO program have diabetes and/or hypertension. These patients would benefit from additional nurse case management support to include medication management, health coaching and disease-specific counseling. As part of our commitment to contribute $50 million toward community health initiatives in 2018, Blue Cross NC is giving $560,000 to Care Ring’s Physicians Reach Out program. The money will specifically go toward hiring two bilingual nurse case managers and two social workers. 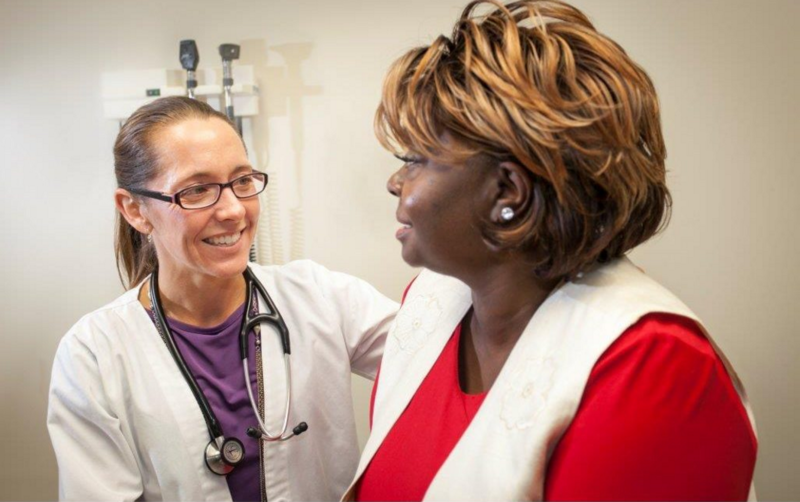 This additional staffing will support PRO’s commitment to volunteer providers as they rely on Care Ring to ensure patients receive the wrap-around services, education, and tools necessary to overcome their significant barriers to health. “The funding from Blue Cross NC is really a game changer. We’ve needed to expand for a long time. The multi-year support will allow us to hire a cadre of case managers to help our patients who are struggling with all sorts of social determinants of health,” says Jonas. By addressing these upstream issues and linking patients to the resources they need most, PRO and Care Ring are helping patients improve their health and productivity and reduce financial stress from high medical costs.